Berlin is enriched by another hotspot for ethical fashion: the Atelier Akeef. Founded in September 2013 by Alan Sommerville and Michael Ashley, it is one of the first in its kind that is specialized on menswear from socially and ecologically sustainable fashion brands. In many ethical fashion stores, menswear is still taking the lesser part, but the offer of good, ethical menswear is rapidly getting better and this is a welcome new retail initiative that will hopefully see more menswear ethical fashion concept stores in other cities around the world..
Atelier Akeef runs a very nice selection of ethically sound brands, with as jeans from Kings of Indigo, bags from Elvis and Kresse, shoes from Ekin Footwear and Veja, and shirts from Knowledge Cotton, Two Thirds and Atelier Awash. While they might not follow the most critical standards for their selection of products (some products are of conventional, non-ecological materials), they have their own score cards on the products showing in what way the product is sustainable. 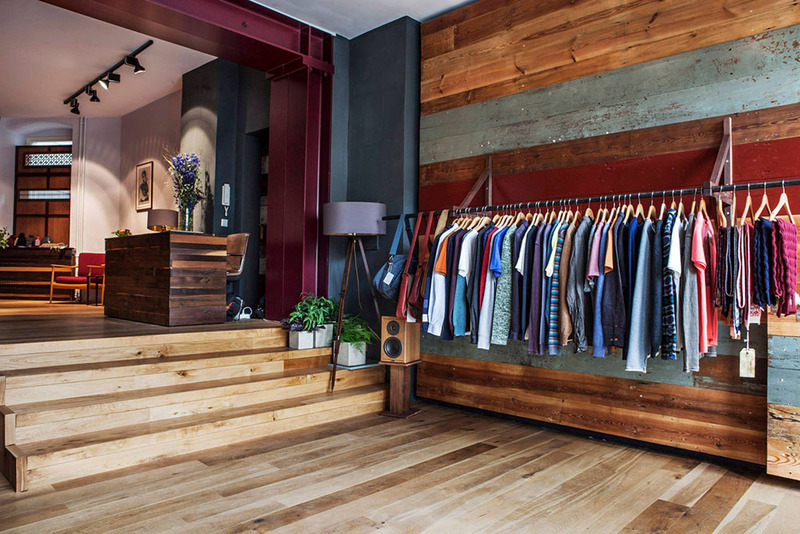 The store has a contemporary, authentic look with many wooden and some recycled and retro elements and is located in Berlin-Mitte.